We needed a beach holiday but the only time available in June was the end of Ramadan so keeping things simple that ruled out both Indonesia and Malaysia. 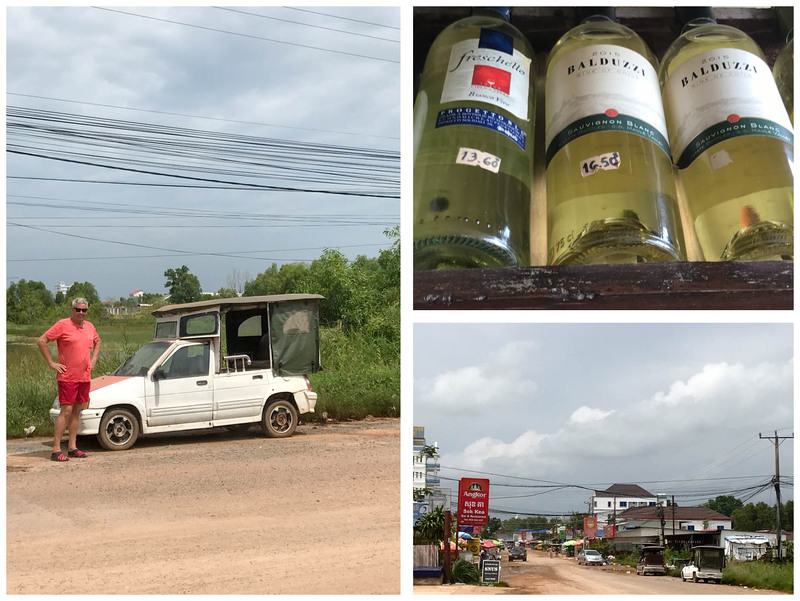 So we headed to the south of Cambodia, re-visiting Otres Beach, a quieter area outside Sihanoukville. 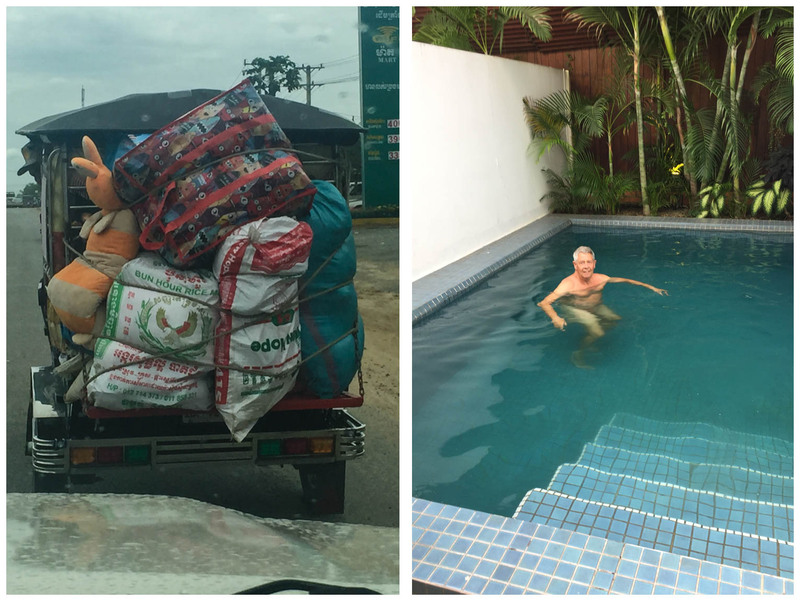 We flew to Phnom Penh and spent 10 minutes looking for our pre-arranged driver. Eventually he turned up with the Andrew sign and apologised - he had been in the bathroom. We got into his Lexus sedan, which seem to be the car of choice for taxis - they are everywhere. He drove safely on the chaotic roads, but spent 75% of his time on his phone during the 3.5 hour drive. 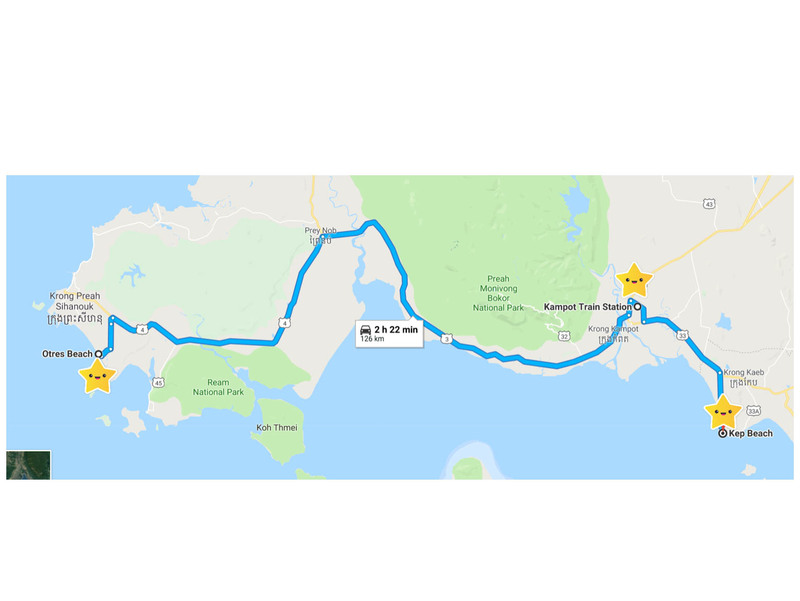 Coming into Sihanoukville we started to see the Special Economic zones and massive construction areas. The area has had (and is still having) huge controversy about development and dislike of particular foreign investors. As we came into Otres II beach, it had changed enormously in the six years since we had last been there. 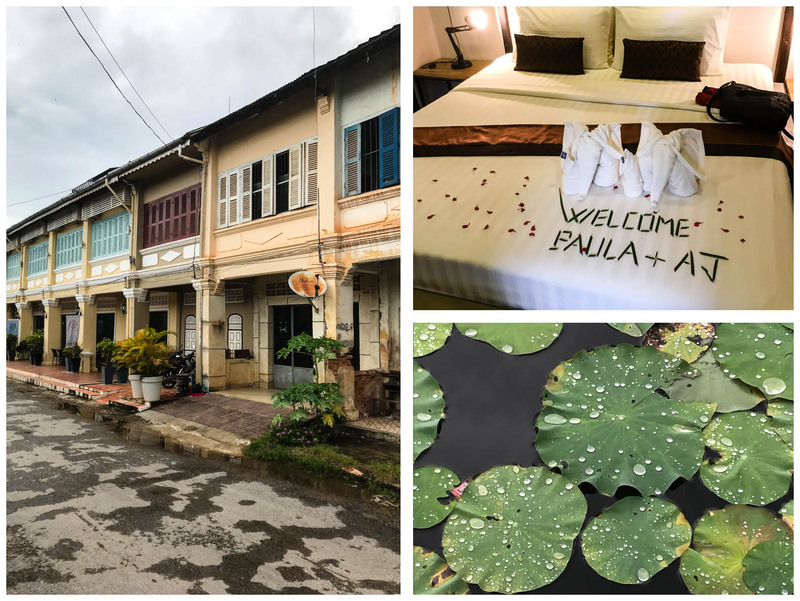 We stayed at Secret Garden, a boutique hotel with individual bungalows. The vegetation has certainly grown between visits - on the left 2012, and much, much, lusher in 2018. 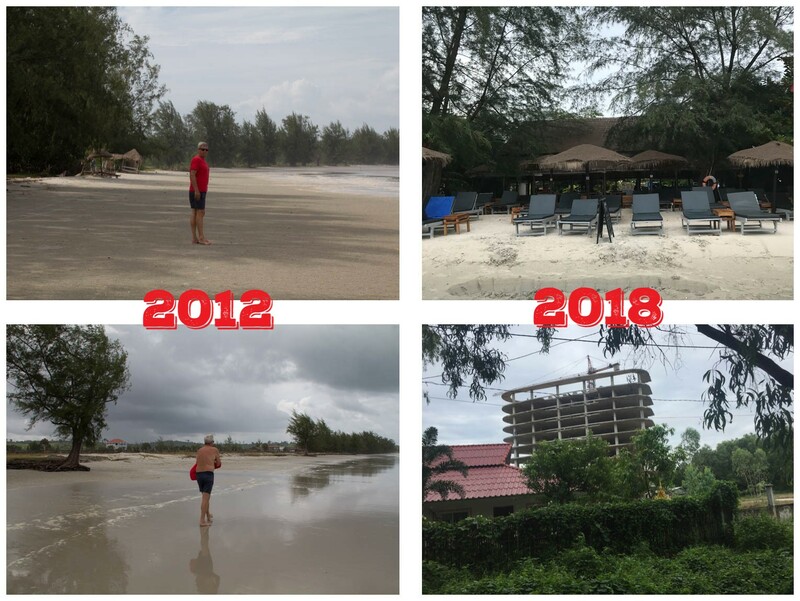 In 2012 we could see through to the beach, now there are larger hotels on each side and construction in all directions. We enjoyed our time, but can see the writing on the wall for the area's future. While the development is had to ignore, the beach is still good. It was rainy season and we had a day of rain when we arrived, but the remainder of the time was overcast but quite pleasant. One day with good cloud cover we both got lightly sun-burned even though there was no direct sun. As a result of the rain there is plenty of mud. From Otres we headed off to Kampot for a couple of days. Kampot is a quiet, small town, with a growing reputation for Kampot Pepper. It has EU recognised Geographical Identification (GI) for pepper grown organically in a specified area. Kampot pepper is considered to be some of the best in the world. 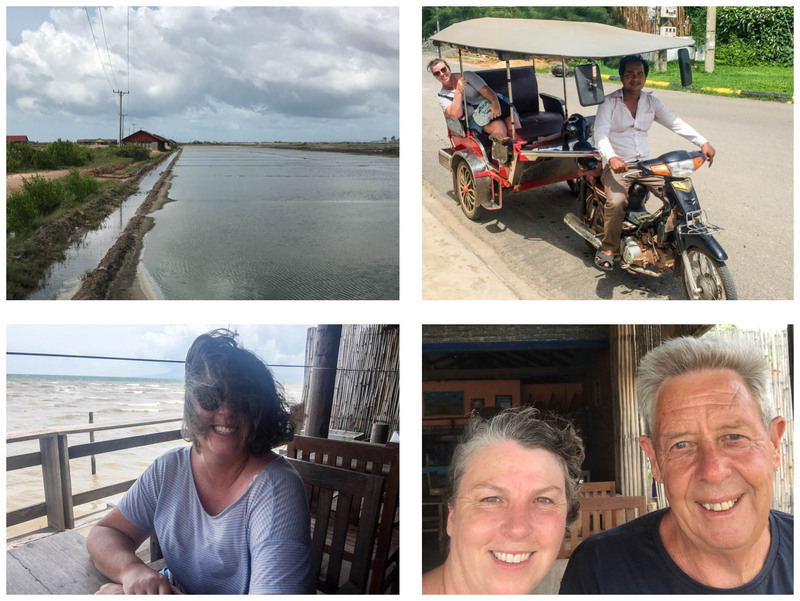 We did a half day day "countryside tour" by Tuk Tuk. First stop was visiting some of the salt fields in the area. There was nothing actually happening at this time of year- - - because salt doesn't dry when it is raining, but we did see a nice video at the Information Centre. While they charged us $2 each to watch the video, we were 'gifted' a bag of salt as part of the admission price. To be honest we didn't feel bad about paying as it supports the community. This area of Cambodia is only now just getting back on its feet economically, after the Khmer Rouge period. Each salt field can produce about a tonne of salt a year. Salt production is also variable with rains at the start of this year meaning no salt production for the 1st quarter of 2018. On average there are 80 to 100 thousand tonnes produced annually. 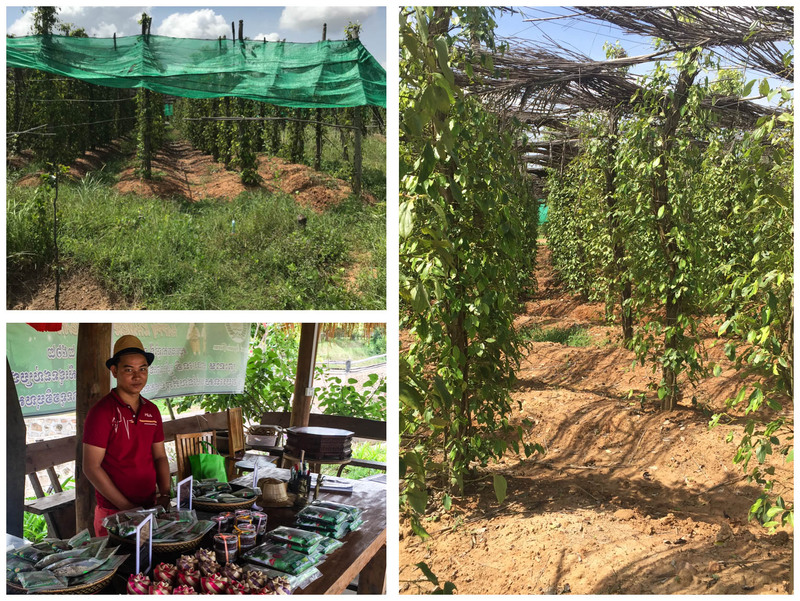 We then visited a pepper-farm and looked at pepper growing. On the way our tuk tuk was stopped on the road and our pictures taken with the Police-Boss. Our driver told him we were from New Zealand, but they didn't look at our passports - just maybe a photo for their collections? And then to Kep for lunch. Kep had been a beach destination before 1975, but has not resurrected that vibe. There are many derelict french mansions and the beach has sand shipped in from Sihanoukville. It is still famous for it's crab and we made our way down to the crab shack restaurants lining the waterfront. These are beside the crab-market, where there is a bustling trade with crabs and other seafood being sold at the market. We selected a restaurant (Holy Crab)that had some meat on the menu for Andrew, and sat on the deck with the sub gale-force wind whipping through our hair. It was actually jolly pleasant. 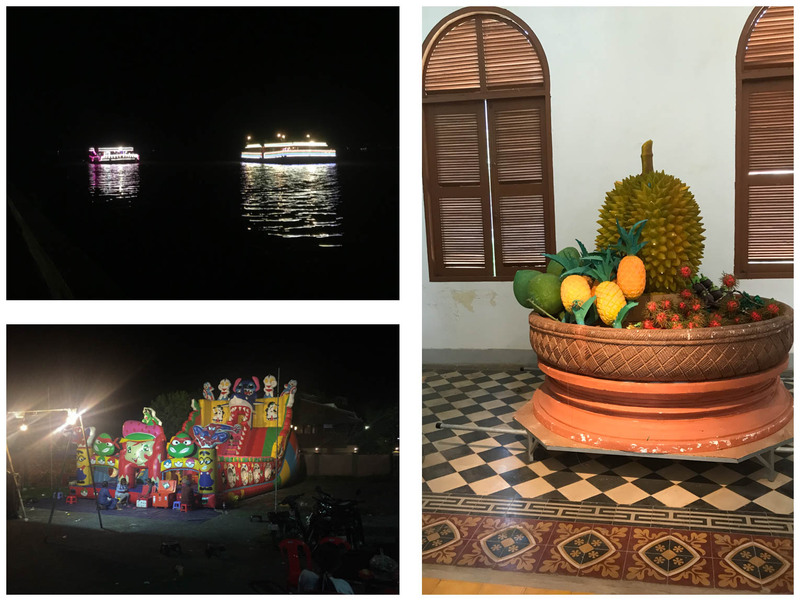 Kampot itself, has a very laid back atmosphere, quite a few expats, and an outstanding culinary scene. We had three superb meals there at Twenty Three, which also had craft beer and at Baraca, where we had delicious tapas. Their Gin happy hour was great and the rosemary infused gin, surprisingly good. And the Sisters bakery had some of the best Chocolate Brownie consumed in the last 3 years! One aspect of the area that should out was the large Muslim population and a large number of Mosques. We didn't do a night riverboat cruise, there were a number of 3-hulled boats waiting to take people for a sunset cruise. But we did visit the Provincial museum. Again $2 entry each, for a very basic display. But we did learn a bit more about the recent history of the area. Below is a picture of a Durian and fruit bowl taking up most of a doorway. At the bottom of the display you can just see a metal pipe. *Most* people would assume it was there to deter people from walking into that corridor. But not Andrew. Ignoring the artistic barrier, our hero proceeded to LOUDLY connect with the metal pipe which violently nudged the whole display half a meter to one side. He proceeded to do some outstanding acrobatic manoeuvres to remain upright and not to face-plant on the floor or to wipe out the display. I am just grateful the sole attendant didn't have to call an ambulance or a clean-up crew. In Phnom Penh we had a little luxury in our hotel, Blue Lime as we had a room with a private pool. Nice! We walked about and generally enjoyed an overnight stay. We had a very good meal at a restaurant around the corner from our hotel. Fat Passion had great ratings on Tripadvisor, but we were the only ones there for about half an hour before a few more groups arrived. You know it was good, when Mr 'I-don't-really-like-fish' tried the smoked Mackerel dip on our appertiser tasting plate and returned for 4th or 5th dips of it. It was good to return to Cambodia. The people are friendly, the food is good, and it is cheap to eat and drink.